I made the mistake of starting Echo 8 after ten o’clock at night. I should know better because I’m familiar with Fisher’s previous books. Echo 8 grabbed me from the first chapter and took me hostage. Thankfully it’s not a super long read so I was able to safely neglect home and family until I made it quickly to the last page. In fact, it grabbed me before the first chapter. Two quotes precede the story, one by Dean Radin, controversial parapsychologist, and one by Emily Bronte, author of Jane Eyre. Anyone who can boldly put those two personalities together on the same page is promising a lot. For me, Fisher delivered on that promise with an original, well-told story. Echo 8’s over-arching premise embraces the possibility of parallel worlds. In this story, one of those infinite number of worlds experiences a global catastrophe that transports people from that world into an adjacent one. They appear as “echoes” of themselves that, without energy from their own world, will eventually fade away and die. They can gain energy from the inhabitants of the world where they land, but such an energy transfer depletes and kills the donor. They unknowingly become walking weapons. Echo 8 is actually a person, Jake, a musician from what may have been Earth as we know it. Tess is a parapsychologist who has been chosen for a special task force to study the echoes. During her research, the FBI begins to take an active interest the task force’s research. Special agent Ross McGinnis is assigned as Tess’s bodyguard when she becomes the first person to survive an energy transfer with an echo. Quantum physics as much as biology has everything to do with the relationships followed in Echo 8. Tess, Ross, and Jake form a love triangle that is satisfactorily resolved, but not until the very last pages. There is a good balance of steamy romance and science to entice both sides of the reader’s brain. I love that Fisher lets relationships drive the story. Too many science fiction writers set up relationships and then ignore them in a way that is not true to life. It makes their stories less real and therefore harder to suspend my disbelief. Fisher parks me on an alternate Earth and I’m happy there. The casual “Big Bang Theory” watcher will have enough understanding of Higgs boson particles to understand the science presented here. It’s all very approachable and I thought, intriguing. I liked the thought that there is something more than emotion that might bind two people together. It speaks to the idea of chemistry and explores the concept of attraction. Why are we attracted to one person and not another before we’ve even met them? Why do some women pick the same kind of guy over and over? What if nature had made some selections for you based on biology and quantum physics made sure you met? I also enjoyed entertaining thoughts of myself in alternate universes. What would the same me, with the same inherent talents and tastes end up doing with her life? Would I be married? Single? A professional cyclist? First flute with a major symphony? Would I be decorating the Christmas windows at Bloomingdales in NY instead being a SAHM? (I have always wanted to do that and I’ve never even been to NY.) Tess gets to see and interact with one version of herself from one other universe and likes her other self. I wonder if I would. Fisher’s unique writing voice is a deceptively soft one. She doesn’t throw the story in your face, rather she lets you come to her in a way that compels you to read “one more chapter.” The tone reminded me not of today’s blockbuster movies, but of the old, black and white “Twilight Zone” episodes; maybe even Bradbury’s Martian Chronicles where nothing is quite like it seems. Fisher lulls you into the complacency of the familiar and then, despite the alarming first chapter, builds to the twist you never saw coming. I think I would really enjoy a seeing this brought to the big screen. 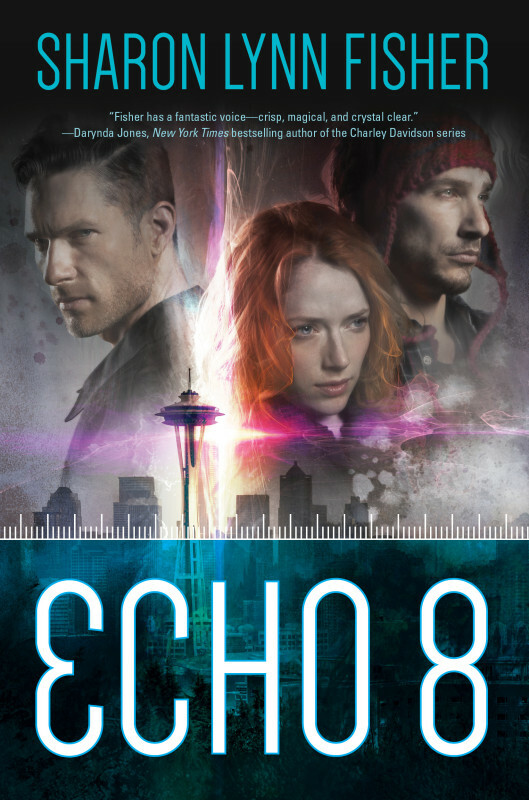 Echo 8 is short enough that I don’t think much would be lost in the transition to screenplay. Someone work on that, would you? After dislocating to Seattle Psi from the other Earth, Jake is confined by a special task force for study. But when he drains life energy from Tess, almost killing her, it causes a ripple effect across two worlds – and creates a bond neither of them expected. Ross is an FBI agent ordered to protect Tess while she studies Jake. His assignment is not random – he and Tess have a history, and a connection the Bureau hopes to use to its own advantage. By the time Ross realizes his mission could be compromised, it’s already too late – he’ll have to choose between his love for Tess and his duty to protect the people of his own Earth.